Some day in the far future, if humanity (or some successor species) survives and if we establish ourselves as a spacefaring civilization, we will eventually have the opportunity to research whatever other civilizations exist in the universe and which we are able to find. With a study of multiple civilizations as a point of reference for the idea of civilization, we will not only possess a much richer conception of civilization, we may be able for formulate a genuine science of civilizations — a formal and theoretical science of civilization based on classificatory, comparative, and quantitative concepts that can be applied to known civilizations and employed in the prediction of not-yet-known civilizations. Rudolf Carnap's account of scientific concepts from his Philosophical Foundations of Physics. Let us begin, however, with something smaller and much more modest than entire civilizations, but something upon which civilizations are crucially dependent. Let us, then, begin with ideas. The natural history of non-temporal transcendencies is the history of their epistemic order in human knowledge. This remark could use some elucidation, since I have alluded to some ideas that are perhaps not widely known. I think that in this final passage of his lectures on time consciousness that Husserl has gone beyond a strictly phenomenological account and has almost imperceptibly passed over into metaphysics with his assertion that, “beauty, pleasantness, etc., have no place in nature and in time.” In other words, Husserl makes the claim that non-temporal transcendencies have no natural history. But in phenomenology nature has been suspended, so it is not within the competency of phenomenology to say that anything has no place in nature. 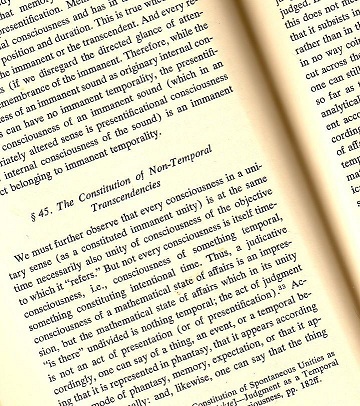 Husserl is here struggling with the problem of apparently non-temporal objects in the light of the universality of constituting time consciousness, and he can’t quite yet see his way clear to a purely phenomenological treatment of non-temporal transcendencies. Fortunately, although Husserl himself didn’t seem to make the leap, all the elements necessary to that leap are there in his thought, and it doesn’t take much phenomenological reflection to realize that non-temporal transcendencies have a peculiar way of appearing to consciousness, and that being a non-temporal transcendency is nothing more (for the phenomenologist as phenomenologist) than this peculiar way of appearing — a presentation in the derived sense, as Husserl calls it. When we call logic analysis of thought the expression should be interpreted so as to leave no doubt that it is not actual thought which we pretend to analyze. It is rather a substitute for thinking processes, their rational reconstruction, which constitutes the basis of logical analysis. Once a result of thinking is obtained, we can reorder our thoughts in a cogent way, constructing a chain of thoughts between point of departure and point of arrival; it is this rational reconstruction of thinking that is controlled by logic, and whose analysis reveals those rules which we call logical laws. The two realms of analysis to be distinguished may be called context of discovery, and context of justification. The context of discovery is left to psychological analysis, whereas logic is concerned with the context of justification, i.e., with the analysis of ordered series of thought operations so constructed that they make the results of thought justifiable. We speak of a justification when we possess a proof which shows that we have good grounds to rely upon those results. I have elsewhere discussed rational reconstruction so I won’t go into any detail on that here, though the idea of rational reconstruction is fundamental to Reichenbach’s project and in fact inspires the distinction. Reichenbach’s distinctions implies that there are at least two orders into which human knowledge can be organized: in the order of discovery or in the order of justification (presumably in a mature theoretical context). What Reichbach does not say, but which we can extrapolate from his distinction, is that there are both ontogenetic and phylogenetic orders of discovery. The individual’s order of discovery may well differ from the order of discovery chronicled as “firsts” in the history of science. There may also be individual and social orders of justification — ideally there would not be, since this would imply multiple theoretical contexts, and even a personal theoretical context, but we must at least acknowledge the possibility. While what Husserl called nontemporal transcendencies have no “history” of their own, no development or evolution, they do however have a human history in the order in which they have been grasped by human minds, and then in the forms in which they have been sedimented in human cultures. Moreover, their presentation in a derived sense exhibits characteristic forms of order, and among these forms of order are the order of discovery and the order of justification. The natural history of non-temporal transcendencies is the history of their genetic order in the epistemic frameworks of sentient beings. Any sentient being capable of cognizing a non-temporal transcendency (i.e., thinking abstractly about an idea) constitutes an instance in the natural history of ideas, whether that instance of cognition is human cognition, another terrestrial species, or some non-terrestrial species. In this way, we understand that ideas may be mirrored in the consciousness of many different peoples. Under the aspect of the plurality of conscious minds, the natural history of ideas takes on a new and far more complex aspect. If we could plot the natural history of ideas (i.e., the derivative appearance of non-temporal transcendencies in cognition of sentient beings of any species whatever) on a graph, I think that this would go a long way toward formulating a science of civilization, since civilization is founded on ideas, albeit ideas that are always found in their implemented form. Mapping the emergence of ideas in a wide variety of diverse civilizations may even suggest empirical generalizations, and from empirical generalizations laws could be formulated and predictions made. The more research we are able to do in the natural history of ideas (possibly one day extended by the technology of a spacefaring civilization), the more likely we are to find unusual or unexpected instantiations of an idea. There are likely to be some very interesting exceptions to the rule. At the same time, a large body of research could eventually establish some norms for particular classes of civilizations and how these relate to each other. The Kardashev scale is perhaps the first step in this direction. We might even formulate quantitative concepts of civilization into a graphic representation analogous to the Hertzsprung-Russell diagram, which in its simplicity reveals the “main sequence” of stars by considering only the variables of luminosity and surface temperature. We may discover that there is a “main sequence” of civilizations, and perhaps this civilizational “main sequence” corresponds to the macro-historical sequence of humanity thus far — nomadism, followed by settled agriculturalism, followed by settled industrialism. I suspect that we will always find that settled agriculturalism is the civilizational prerequisite for the emergence of industrial-technological civilization. Michio Kaku, in his book Physics of the Future: How Science Will Shape Human Destiny and Our Daily Lives by the Year 2100, suggests a quantitative measure of civilization based on the Kardashev scale and Carl Sagan’s information processing typology. While Kaku’s thought remains on a primarily classificatory or typological level, we could easily plot a civilization’s energy use (or energy flows, if you prefer) on one axis of a graph and its information processing ability on the other axis of a graph and come up with a quantitative presentation of civilization typologies. We would plot known earth civilizations on such a graph, but we wouldn’t really get all that far considering only earth civilizations. Ideally we would want to plot as diverse a set of civilizations as we plot diverse stars from all over the universe on the Hertzsprung-Russell diagram. It could also be observed that, in the same circumstances as stated above, in the far future of a human spacefaring civilization, that human beings (or their successor species) will also gather an enormous amount of information about the universe, and possibly also the multiverse (should the world reveal itself to be more than that which can be seen with contemporary technology). No doubt many strange and wonderful things will be discovered. But we have sciences that are capable of comprehending such things. Extended conceptions of astronomy, astrophysics, and cosmology will be able to include within their growing bodies of knowledge every outlandish natural phenomenon that we might chance to encounter in the wider universe, but there is nothing, either in a present form or in an inchoate extended form, that can do this for civilization. There is no science of civilization at present, or, at least, nothing worthy of the name. We could formulate a science of civilization exclusively on the basis of civilizations on the earth — it could be argued that this is what Toynbee attempted to do — although this would be anthropically biased and not as valuable as a future science of civilization that could draw upon the data of many different civilizations on many different planets. While we are on the verge today of just being able to glimpse other planets around other stars, it will be some time yet before we are able to glimpse other civilizations, if there are any.